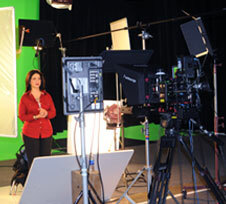 Our 34'X 43'(1,450 square feet) studio is versatile and fully equipped. It features two 34' hard cyc walls - one green and one white - as well as dedicated tungsten lights in the grid. You'll also find a full kitchen, a makeup room and roll-up bay doors for easy load in. Add in a complete lighting package and a choice of cameras, and you've got a VERY convenient, efficient and comfortable place to shoot your next project. You can rent all or part of what we offer. And if you need a director of photography, gaffer, grips, teleprompter, make-up, PAs - you name it, we can provide it. We hope to see you on your next shoot! CONTACT for studio rental and information.